Rhodochrosite, from the Sweet Home Mine, Colorado. Antonio Neri is widely recognized for publishing a recipe for the coveted and difficult gold ruby glass. "Rubino" as it is sometimes called achieves a deep ruby red color utilizing only powdered metallic gold as a colorant. Perhaps because of the notoriety of that prescription, Neri’s other transparent red glass is hardly known. His recipe #120 describes a deep red pigment based on manganese. Today manganese takes its place on the periodic table as an elemental metal, but in the early seventeenth century it had not been isolated from its mineral ore. What Neri calls manganese was actually its oxide, which occurs as a black powdery material. Its effects in glass have been known since the early Egyptian dynasties and before that, as a pottery glaze. By itself the oxide produces a tint often likened to violet or amethyst. In small quantities, it is used to neutralize the slight green tint introduced by iron impurities in clear glass. To make his ruby red pigment, Neri starts with high quality manganese oxide from Piedmont and processes it through several alchemical operations. I will not be delving into the chemistry in detail here, but suffice it to say that he comes astoundingly close to synthesizing a highly unstable explosive, the likes of which was not "discovered" for another two centuries. It is a striking illustration of how technical ability can be in place long before theory catches up, in this case thankfully so. The pigment he did succeed in making is for now a mystery. Manganese carbonate, which can form ruby red crystals might fit the bill, except that it decomposes at the temperatures of molten glass. 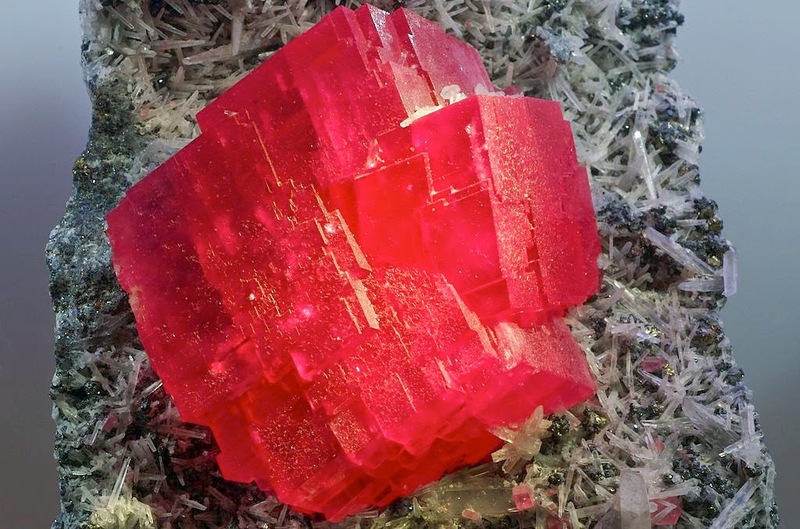 It occurs in nature as the mineral rhodochrosite as seen above. Below is Neri's recipe for "Transparent Red in Glass" from his 1612 book L’Arte Vetraria. Most of the terminology is straightforward, with the exception of a few terms. 'Porphyry' is a hard granite used for grinding stones. 'Reverberation' is indirect radiation in a furnace, where the heat is reflected from the walls. 'Sublimation' is when certain materials vaporize directly from a solid form and recondense without passing through a liquid phase. Grind manganese impalpably, then mix it with an equal amount of refined saltpeter and put it into a clay pan set to the fire, reverberating and calcining it for 24 hours. Take it then and wash its saltiness away with warm common water. Once separated from the salt, let it dry. It will be a ruby-red color. With this, mix an equal weight of sal ammoniac and grind them together over porphyry stone with distilled vinegar, which they will soak up. Leave this alone to dry and then put it in a retort with a wide body and a long neck. Heat it in sand for 12 hours to sublimate. Then break up the glass. Take all the deposits in the neck and body of the retort and mix it with the residual remains in the bottom. Weigh it and combine it all with as much sal ammoniac as was lost in the first sublimation. Grind everything together over the porphyry stone, with distilled vinegar for it to soak up. Then put it in a retort to sublimate as above. Repeat this sublimation, in this manner, many times until in the end, the manganese will all remain fusible in the bottom. This is the medicine that tints crystal and pastes in a diaphanous red color and a ruby red as well. Use 20 oz of this medicine per ounce of cristallo or glass, but more or less may be used accordingly to govern the color. The manganese should be the very best from Piedmont, so that it will have the effect of tinting the glass a beautiful ruby color and be a sight of wonderment.